On 13 June 1887, Swaine & Adeney wrote a request to J.E. Wakefield, the clerk to the Metropolitan Board of Works, requesting permission to erect temporary seating in front of their shop windows, in order to enable their guests to see the “reception” of 21 June. What they meant was the Jubilee procession to mark the 50th anniversary of Queen Victoria’s reign. An eyewitness report of the event can be found here. 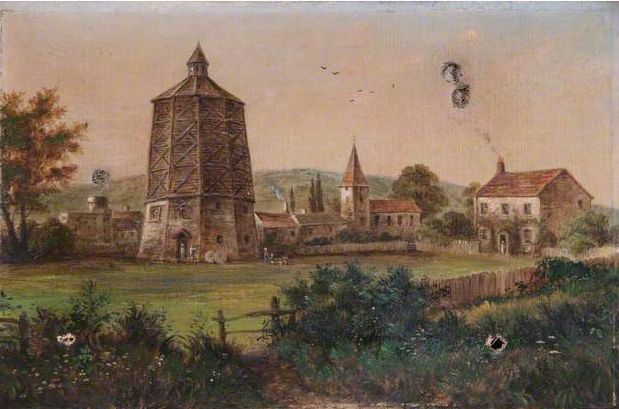 The Metropolitan Board quickly responded after receiving drawings of the intended structure and the licence was granted “upon condition that the whole of the works be executed to your [that is the district Surveyor, R. Kerr’s] satisfaction and that the erection be taken down and removed by the owner at his own expense within a period of one month from the 20th day of June 1887”. Swaine & Adeney were not the only ones to put up jubilee seating. A similar, but much bigger structure was put up by the Raleigh Club at 16 Regent Street, and no doubt many more shops applied for similar licences. 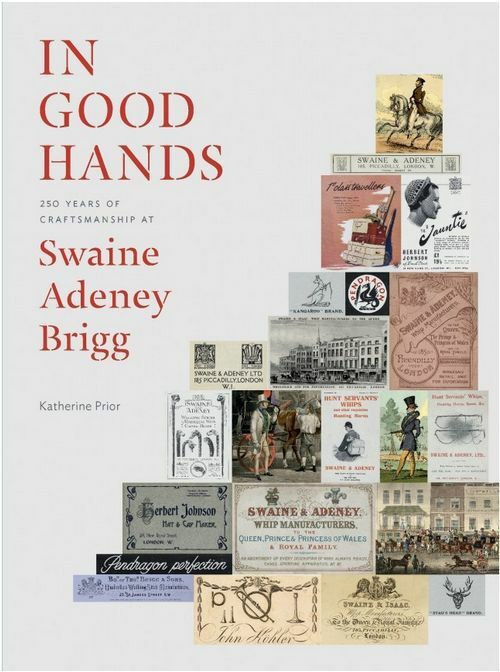 More on the later history of the firm and the various business they took over, such as J. Köhler & Son and Zair Ltd, can be found in Katherine Prior’s In Good Hands: 250 years of craftsmanship at Swaine Adeney Brigg (2012), but here we will mostly concentrate on the earlier history of the firm. 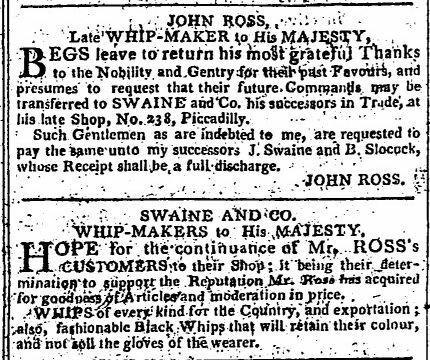 As an early trade card states, Swaine & Co. took over from Mr. Ross, that is John Ross who had had a whipmaker’s business at 238 Piccadilly since 1770. 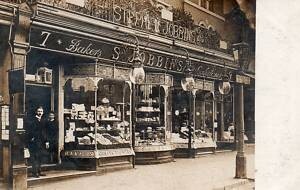 He had moved there after a devastating fire at his old premises in Marylebone Street. 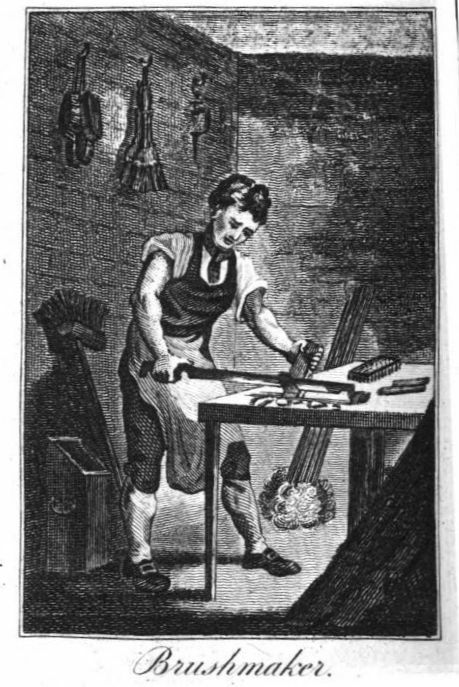 Although he became “whipmaker to the Royal family” in 1797, the surveyors for the Crown deemed his shop dilapidated and unhygienic and ordered £120 worth of repairs. 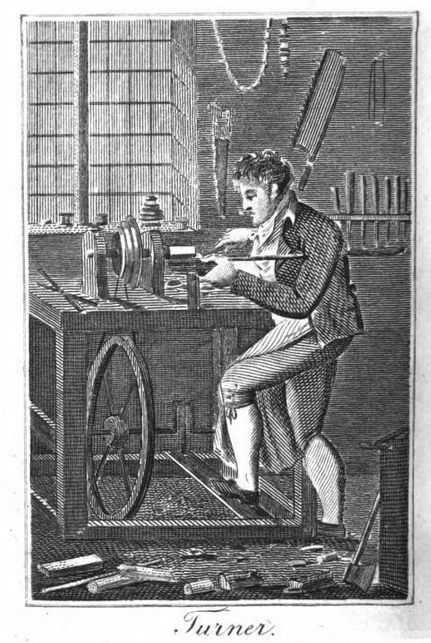 In 1798 Ross sold out to whipmaker James Swaine and brewer Benjamin Slocock, the latter the financial partner and possibly a relation of James’s wife. Edward Swaine, James’s son, was later to be apprenticed to Slocock. (1) James himself had been apprenticed in 1782 to Benjamin Griffith, a whipmaker of High Holborn. 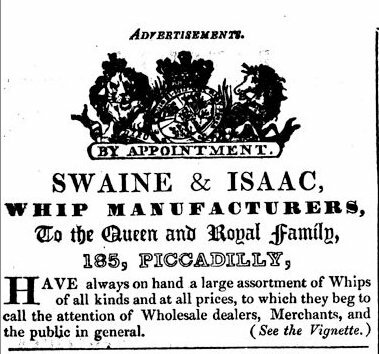 The Griffiths and Swaines remained in contact after Swaine set up on his own and Charles Griffith was at one point licensed by Swaine to produce some of his whips. 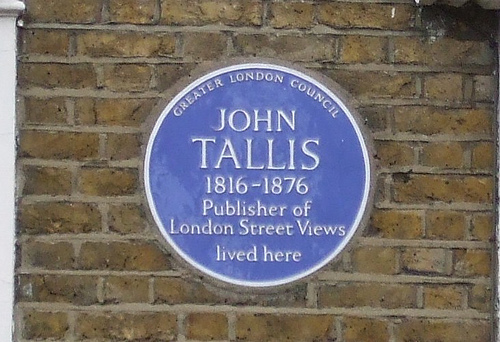 By 1822, the whipmakers had moved from 238 to 224 Piccadilly and were to move again in 1835 to number 185 where Tallis was to find them. Benjamin Slocock had retired from the partnership by then (in 1825 or thereabouts) and was followed by a new partner, William Isaac. 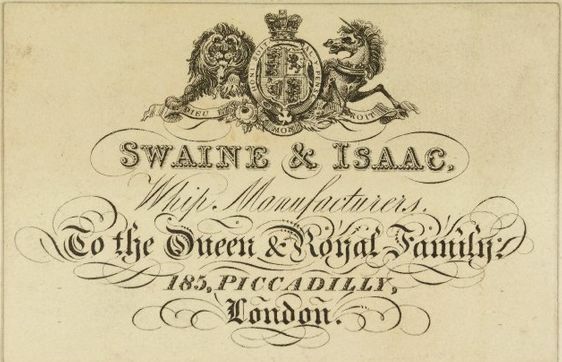 James Swaine died in September 1837, but the year before, son Edward had taken up the freedom of the City via the Brewers’ Company, which he could do because of his apprenticeship at Slocock’s. In theory, he need not have done so as Piccadilly does not fall under the jurisdiction of the City, but he probably found it advantageous for other reasons, such as the contacts with other freemen; never a bad thing for a businessman. 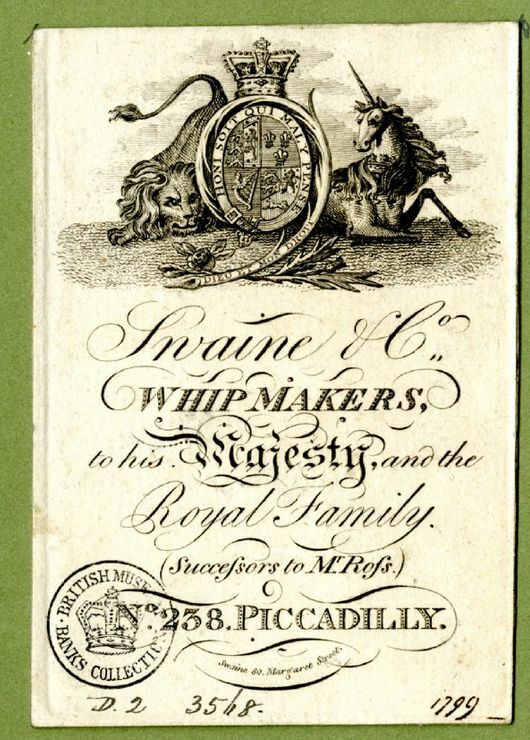 Also in 1836, James Adeney, the son of Mary Ann Swaine, was apprenticed into the business and he was to become an important part of the whipmakers’ firm. 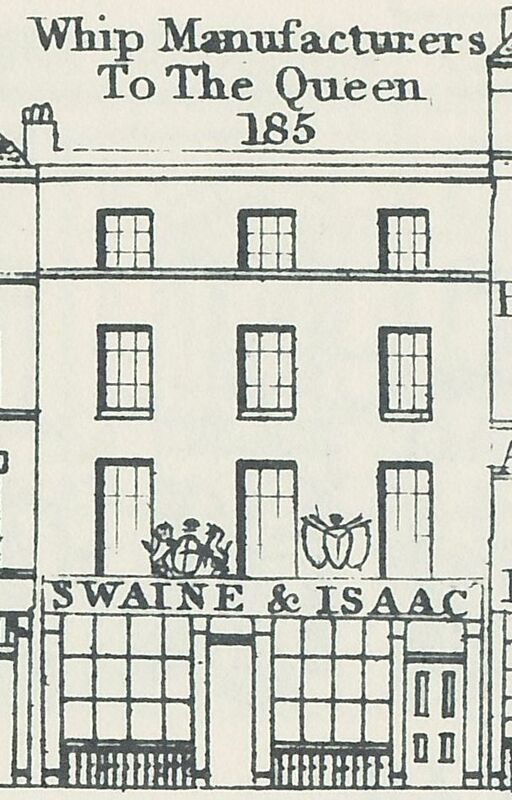 In September 1848, William Isaac pulled out of the partnership(2) and Swaine and Adeney continued the business together. 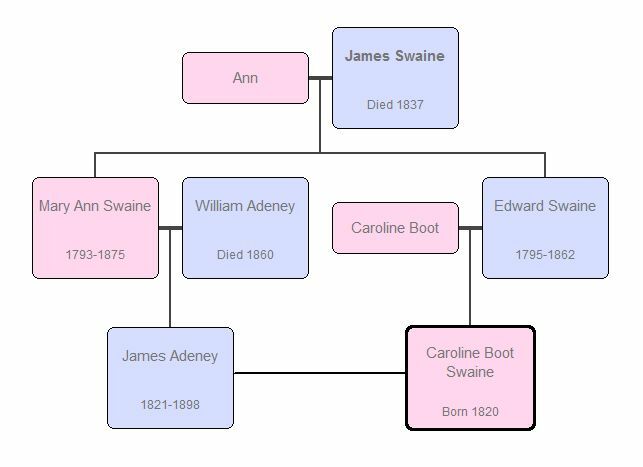 As you can see from the family tree below, the Swaines and Adeneys were twice connected by marriage; first of all by the marriage of James Swaine’s daughter Mary Ann to William Adeney and a generation later by the marriage of the two cousins James and Caroline, thereby consolidating the ownership of the business. In 1851 (and indeed in 1861), the census found the whole family, that is: Edward and his second wife Sarah, daughter Caroline and her husband James Adeney and their two young children Edward S. and James W., all living together at 185 Piccadilly. 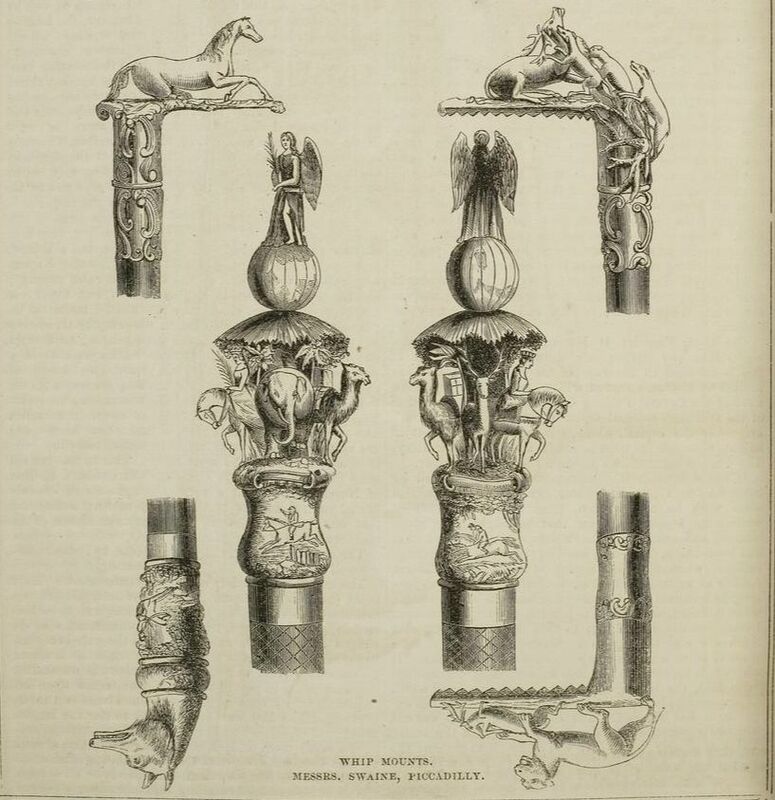 1851 was also the year in which Swaine & Adeney entered a numbers of whips in the Great Exhibition and they were favoured with a prize medal and an illustration in The Illustrated Exhibitor. 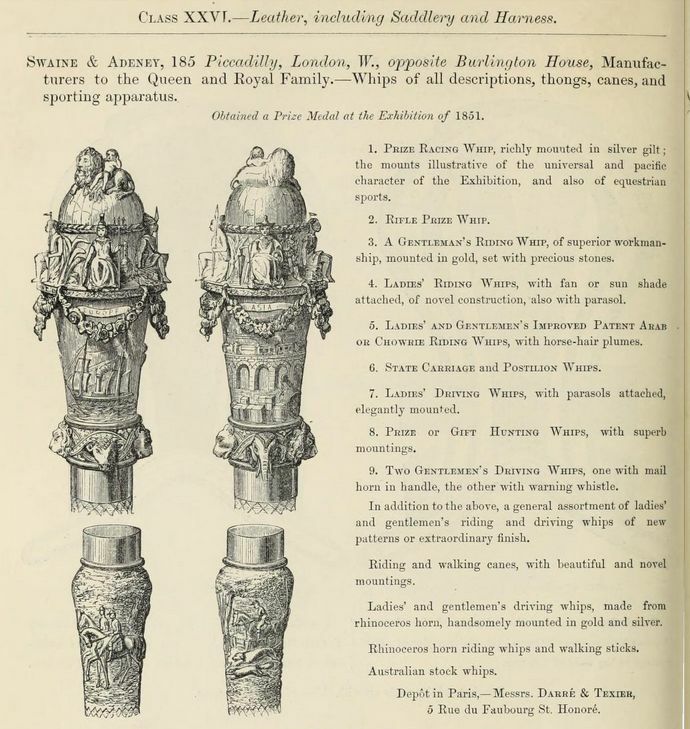 The catalogue compared the entries of whips from many countries and said that “perhaps the best show of them all is that made by the firm in Piccadilly, from whose trophy the whip-heads in our engraving have been chosen”. 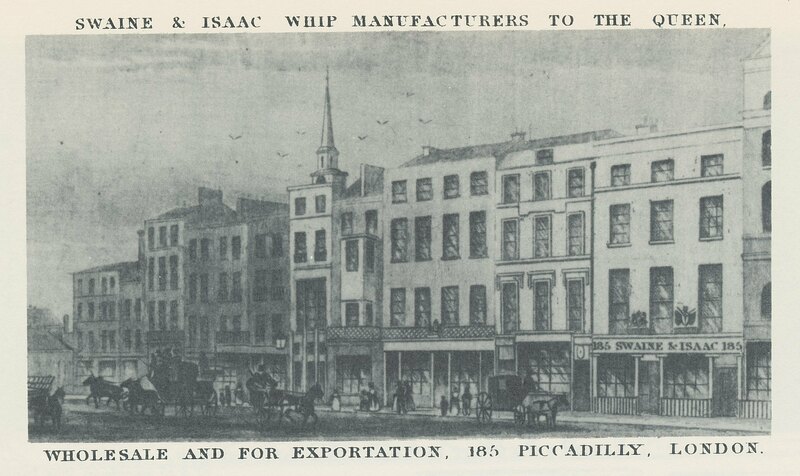 And in 1862, the whipmakers repeated their performance at the International Exhibition at South Kensington. Their entry in the catalogue also listed the address of their depot in Paris, where Messrs Darré & Texier were apparently acting as their agents. 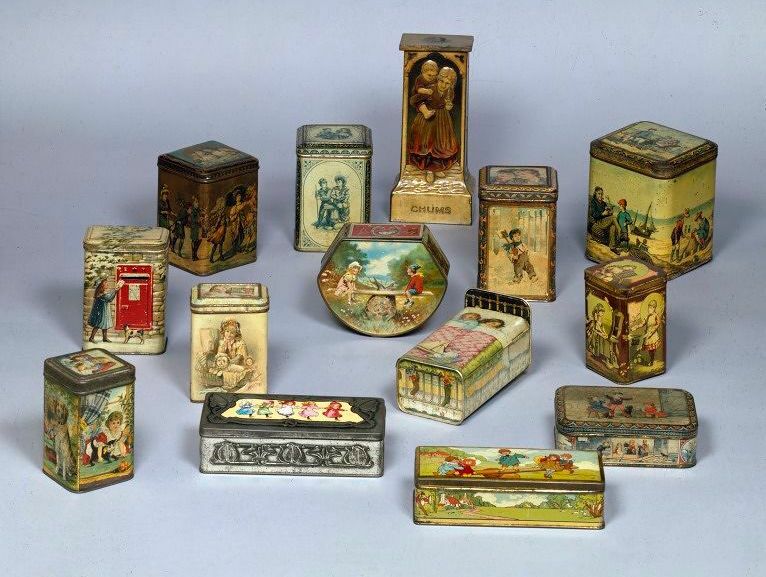 The company received many more prizes in other exhibitions and shows, but the 1851 and 1862 were the two most important ones and gained them an influential and international clientèle. 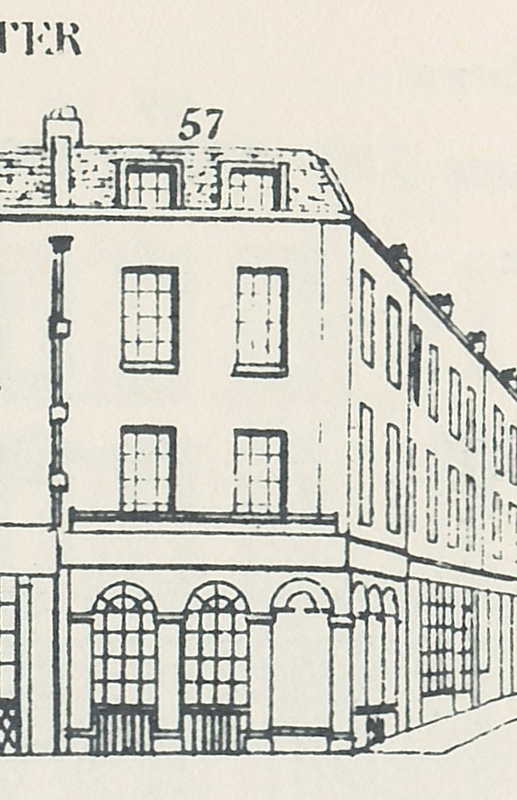 The situation of their shop in Piccadilly was a good one, as they were close to all the grand houses in the vicinity and the gentlemen’s clubs, such as Boodle’s and White’s, both in St. James’s Street. They also secured the patronage of various Royals and were not shy in advertising such whenever they found an opportunity. In 1889, the lease on their premises came up for renewal and Katherine Prior tells us that the new lease from the Governors of Bethlehem Hospital was to run for 80 years at an annual rent of £340; not a bad price for such an advantageous spot. 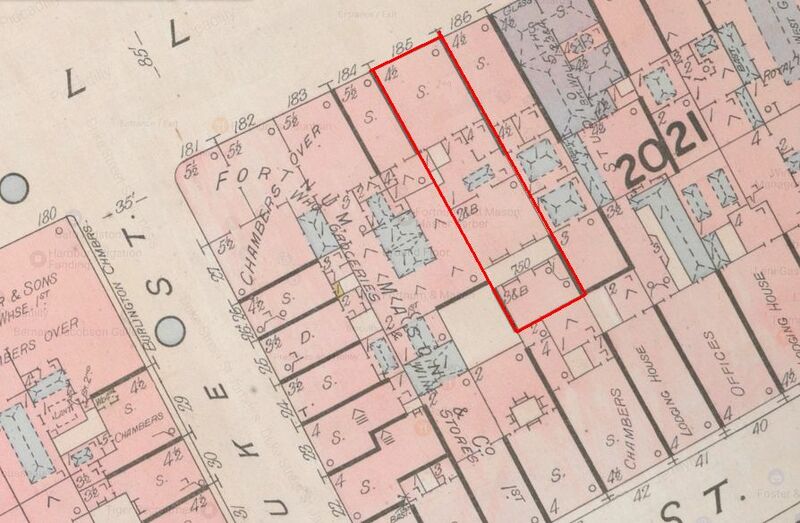 The new lease came with a floor plan (Prior’s book, p. 38), but I have drawn the plot in red on Goad’s 1886 insurance map. By the time of this new lease, a new generation was in charge. 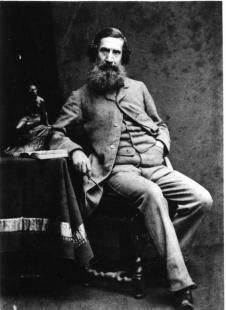 Edward Swaine had died in 1862 and the sons of James Adeney, Edward Swaine Adeney and James William Adeney, had joined their father in the business. James Adeney died in 1898, which was only a couple of years after the first motor cars appeared on English roads. Cars were to change the business from one that could, throughout the nineteenth century, rely more or less completely on the manufacturing of whips, to one that had to diversify and adept to a changing world and it was not long before they manufactured luggage sets for motor cars, polo sticks, balls and helmets, hunting horns, and, with the amalgamation of Swaine and Adeney with Thomas Brigg & Sons, also umbrellas. 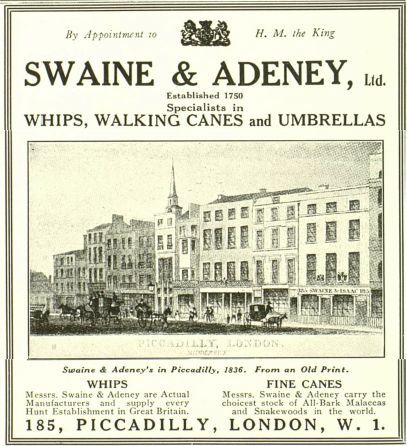 More companies were taken over, subsumed, or bought, but if you want more details on all those later changes, I refer you to Prior’s book which does a much better job of telling the later history of Swaine & Adeney than I can do in the limited space of this blog post. 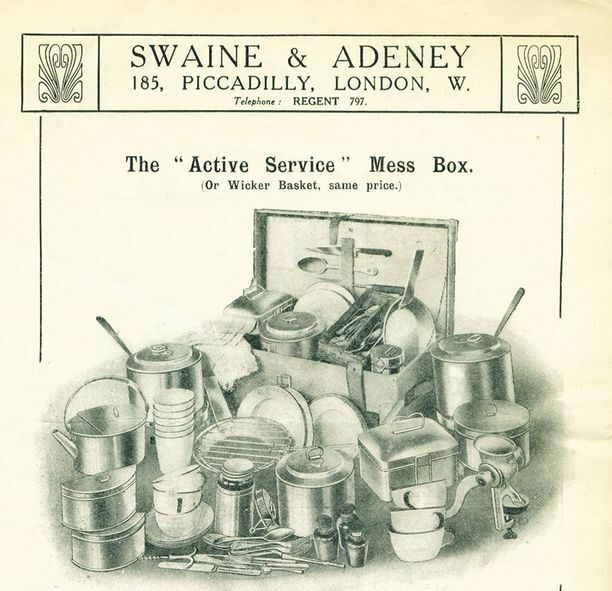 I’ll just leave you with a few more pictures and a link to the Swaine Adeney Brigg website (here). advertisement in The Spur of 15 July 1922 where Tallis’s vignette has been carefully copied. (1) His indenture dates from 8 February 1810 and mentions that the contract was taken out for seven years – the normal term for an apprenticeship – and for “no consideration” which is more unusual, but no doubt explained by the partnership between Edward’s master and father. Edward was to obtain his freedom of the Brewers’ Company in 1836, although he could have done so in 1817. (2) The London Gazette, 9 March 1849. 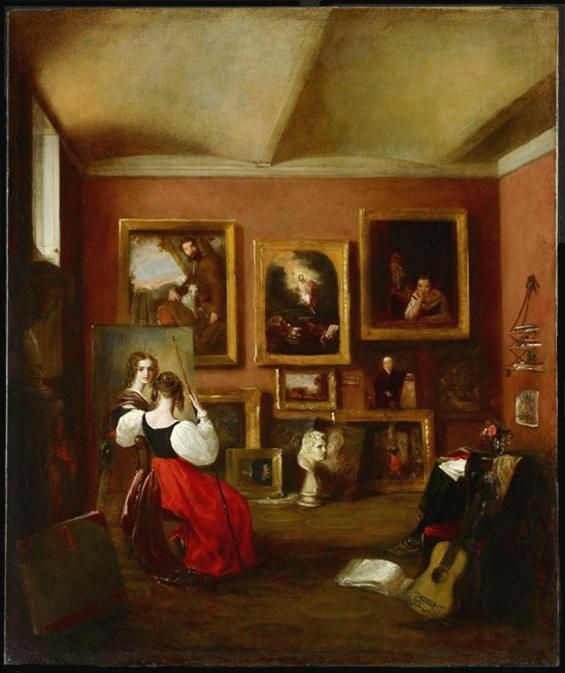 But James did not survive his mother for very long and died in May 1840, a few months after his wife Harriet (née Woodman; she was the daughter of James Woodman, hairdresser at 46 Piccadilly). He made a new will, dated the 21st of May 1840, in which he left all his property for the use of his three children Charles, Henry, and Chaloner, for whom he appointed his sister Mary Ann guardian. She, her husband Harry Criddle, and their sister-in-law Frances, the widow of their brother Henry, were to be joint trustees. 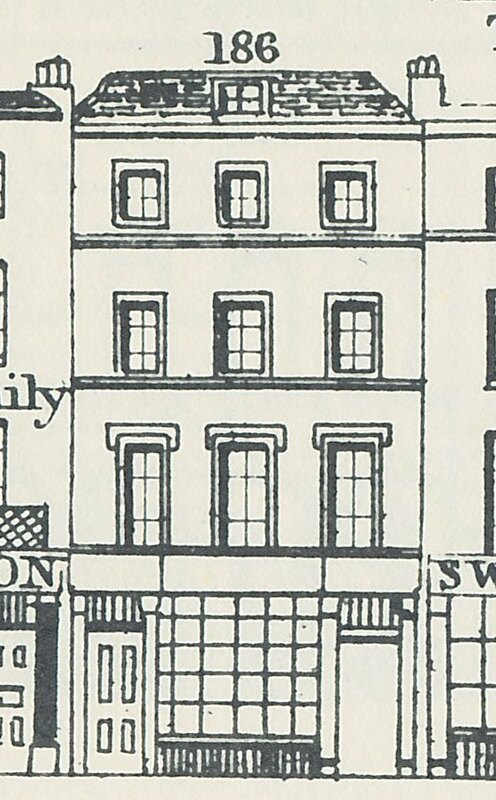 James mentions the business at 58 Piccadilly, which, as long as the trustees thought it profitable, was to be continued by the three of them, but one fourth of the profits thereof was to go to Frances “as a repayment and compensation for her time and labor”. Another fourth part is to go to Mary Ann and her husband and the remaining two fourths are to go to the guardians in trust for the children. He would like one of his children to take over the business with the other two to receive their portions of the estate. (4) James was buried in All Souls Cemetery, Kensal Green (more on the family grave here). 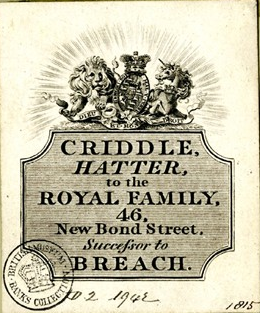 Mary Ann’s husband, Harry Criddle, was the son of Harry Holman Criddle, a hatter who had been in partnership with John Breach at 46 New Bond Street until February 1810 when they dissolved the partnership. 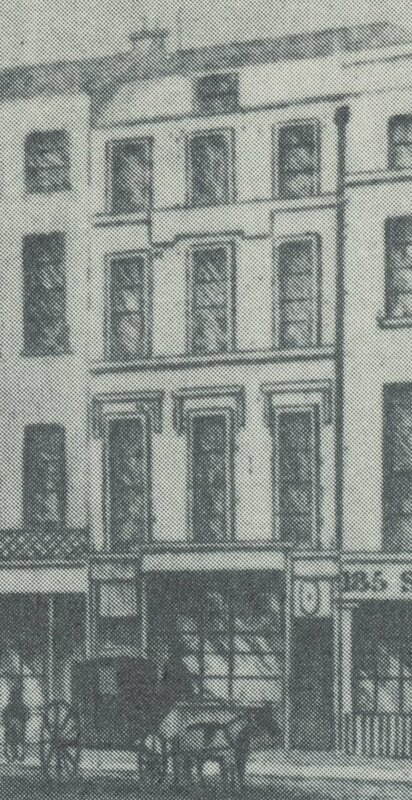 Harry Holman continued the business on his own, later at 148 New Bond Street. 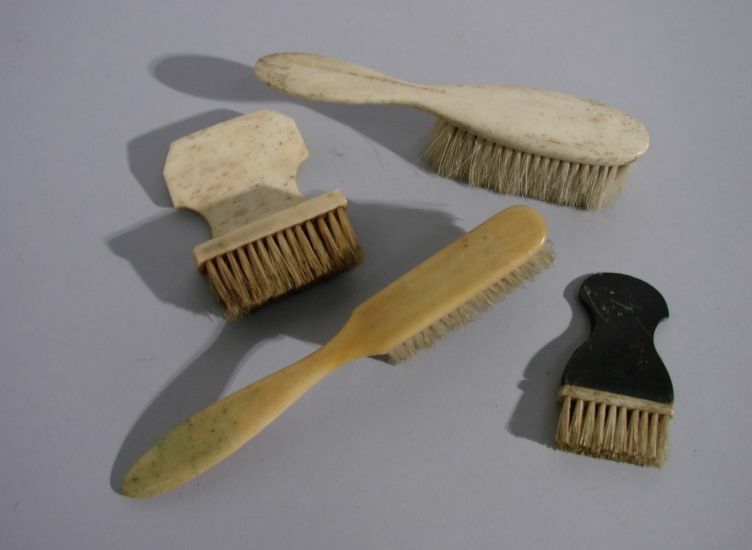 The tax records show the names of Alabaster and Criddle for number 58 till 1850; the following year, the tax for the property is paid by Emma Gill and Ann Jeffries, fancy stationers, whom we also find at number 58 in the 1851 census. Harry and Mary Ann Criddle, with their son Percy and nephews Charles and Henry Alabaster are found at 115 Piccadilly. Harry is listed as ‘proprietor of houses and superintendent of trade in Leghorn bonnets’. Charles is listed as student of King’s College, London, and he was later to study at Lincoln College, Oxford. He became a priest, from 1859 onwards in Christchurch, New Zealand, and died there in 1865 of tuberculosis. His brothers Henry and Chaloner were both diplomatically involved in the Far East; more on them here and here. So none of the Alabaster children seemed to have had the inclination to continue their father’s straw bonnet shop, but that does not mean that the business was terminated when they went off to their various careers in foreign parts. The 1851 Post Office Directory still lists the business of Charles Alabaster, straw and fancy hat maker at number 58, but in the 1856 Post Office Directory number 58 is no longer mentioned, which accords well with the tax records. However, at number 115, the Post Office Directory lists the firm of Alabaster and Toovey, straw hat makers, certainly suggesting that Criddle continued to work in the straw hat industry. He died in 1857. 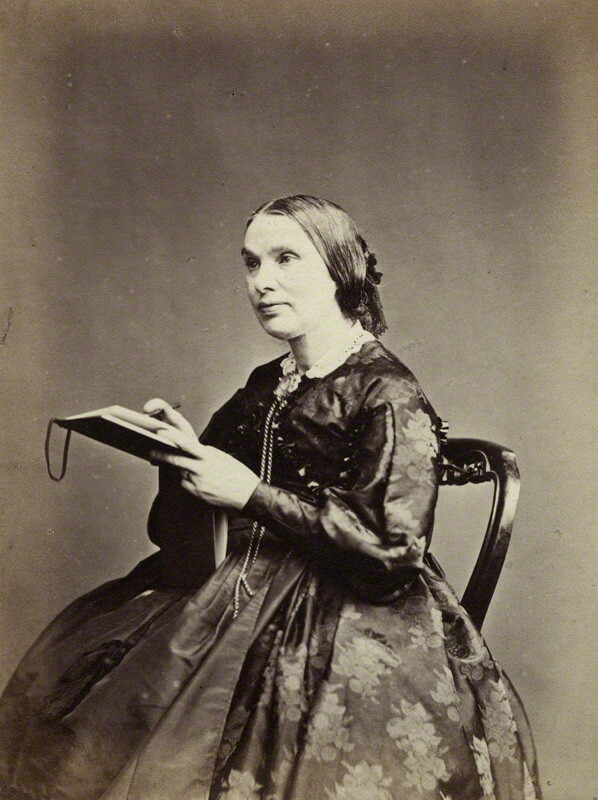 (7) Mary Ann retired to Addlestone, Chertsey, Surrey, where she died in late 1880. 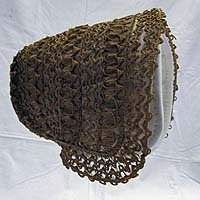 No more is to be said about the straw bonnet business, but if we go back in time, another aspect of the Alabaster/Criddle family comes to light. The Transactions of the Society Instituted at London for the Encouragement of Arts, Manufactures, and Commerce (1826) listed a prize, a silver palette, for a Miss Alabaster of 38 Piccadilly for a drawing in chalk from a bust. 38 was a mistake for 58 and Miss Alabaster was Mary Ann who continued to receive prizes for her art work, for instance in 1832 a gold medal from the same Society for a historical composition painted in oil. More on her artistic life here. 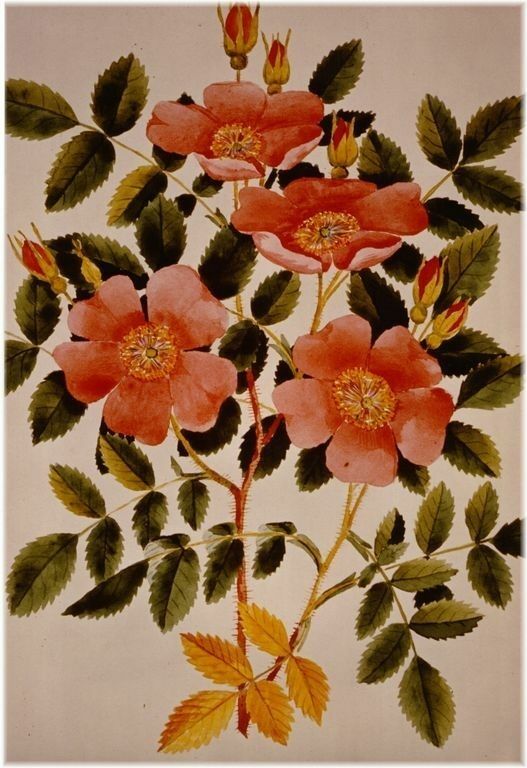 From 1841 onwards, the census entries list her as ‘artist’, and this artistic talent was inherited by her grandson Norman (Percy’s son) who excelled in flower paintings. Percy emigrated to Canada in 1882 and the story of the Criddle family is depicted on the website of the Sipiweske Museum, Wawanesa, Manitoba (see here) Click the ‘thumbnail gallery’ to find more examples of Mary Ann’s and Norman’s art. The Canadian Criddle household was decidedly unusual as Percy not only shipped his wife and children there, but also his mistress and the children he had with her, supposedly as ‘help’ for his wife, later usually referred to as ‘family friend’. You can read more about that side of the story here and here. (1) A lot of research has already been done by others on the Alabaster family and I have made grateful use of the information provided on the Alabaster Society website. (5) London Metropolitan Archives DL/C/518/143. (6) The Northern Star, 10 April 1847. (7) England & Wales, National Probate Calendar (Index of Wills and Administrations), 1858. Effects valued at under £3,000.